Aoi Matsuri (hollyhock festival) in Kyoto Gyoen. 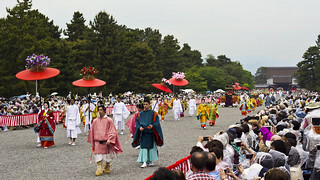 The imperial palace (Gosho) in the background. Shame about the weather. If you use this image, please attribute it with a link reading "Japan Resor" to www.japanexperterna.se, or, where this is not possible, non-linked text reading "Japanexperterna.se". This is a requirement for using the picture under the Creative Commons license.